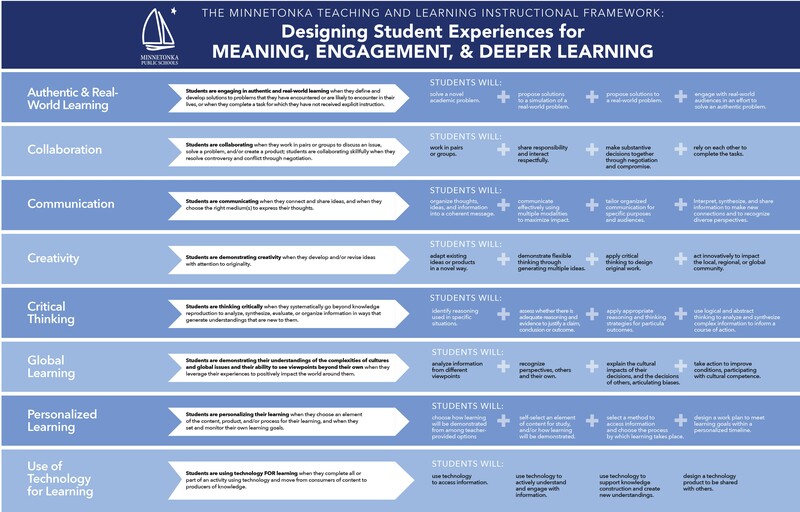 The Minnetonka Teaching and Learning Instructional Framework represents our instructional core values. The eight interconnected dimensions of the Framework have all been identified by our School Board as vital to the student experience. Based on these expressed values, the Teaching and Learning team has built a set of tools that are designed to help Minnetonka teachers create learning experiences for students that are highly engaging. The Framework’s levels of complexity help teachers stretch what they are currently doing in ways that will increase engagement and help connect student learning to the world around them. Education is in the process of an important disruptive transformation. The 21st century workplace looks and feels much different and it demands a different skill set. The Framework helps build student experiences that are rich with the skills that lead to success in the 21st century workplace. If our instruction focuses too heavily on lecture and/or direct instruction, students may do fine on assessments, but the learning won’t stick. We want our students to have the necessary content knowledge, but we also want our students to have the interpersonal and interactive skills to bring that knowledge to life in situations where they are applying their learning to solve unique problems. If we don’t give them ample opportunities to develop those skills now, it may be too late when they reach their chosen field but can’t apply what they’ve learned. You can also submit questions and feedback online and receive a response within one business day through Let's Talk.